By default, every word you look up in the dictionary is added to a list that you can access using Vocabulary Builder. 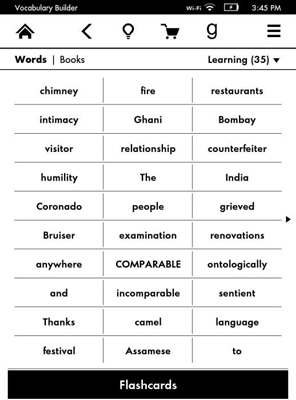 From any book, tap Menu — Vocabulary Builder. The screen shown in the following figure appears, listing the words you’ve looked up. Tap a word to see its definition. On the menu that appears, you can tap the Usage tab to see how the word was used in the book. To change the view from a list of words to the list of books in which you’ve searched for words, tap Books at the top of the screen. The screen shown in the figure below appears. 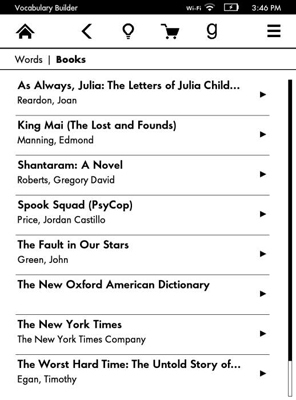 Tap the arrow to the right of a book’s title to see all the words you researched in that book. You can then tap a word to see its definition and its usage in the book. Your Kindle Paperwhite includes a Flashcards feature to help you learn the words on your vocabulary list. As shown on the bottom of the first figure in this article, tap Flashcards to display a screen like the one shown in the following figure. Use the arrows or swipe to page forward and backward through the list. 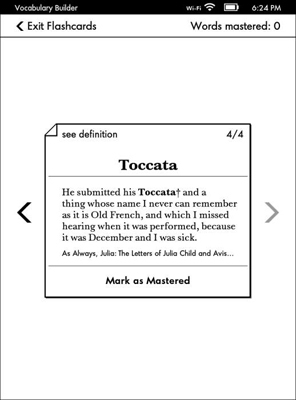 Each flashcard shows the word in context in the book you were reading — if you can’t remember the definition, tap See Definition to refresh your memory. When you’ve learned the word, tap Mark as Mastered to remove it from the active list. Tap Exit Flashcards in the upper left to return to the active word list. You can also mark a word as Mastered from the Dictionary definition screen. Vocabulary Builder appears on your Home screen in your list of books. Tap Vocabulary Builder to open it, just as you would a book. You can access Vocabulary Builder (after you’ve activated it the first time) also from the menu. If your list on the Home screen is sorted by Recent and Vocabulary Builder is the most recent item you’ve viewed, it will be at the top of the list. If your Home screen is sorted by Collections, Vocabulary Builder will be the first item in the list after the listing of collections. As noted, Vocabulary Builder is turned on by default. To turn it off, tap Menu→Settings→Reading Options. Switch the toggle to Off. Now Vocabulary Builder will not appear on your Home screen and the menu option for Vocabulary Builder will appear dimmed. Any words you look up in the dictionary will not be added to your vocabulary list, but any words you’ve looked up previously will be retained.